We expanded the buying guide and the explanation about the distortion effect. We also re-arranged the list with the recommended models accordingly. Are you looking to invigorate your sound with some wild and dirty distortion? Your guitar’s amplifier just isn’t doing enough for you? If you’re an avid fan of various rock iterations all the way up to heavy metal, or anything in-between, then you are going to like this. We’ve carefully reviewed some of the most popular distortion pedals on the market, ranging from new modernized iterations to classic remakes. The list is rich with variety of effects, take your pick and if you’re practicing at home, use them with moderation or you’ll anger some of your neighbors. Classic Big Muff Pi tone packed into a smaller, more flexible design. Fully analog distortion that brings an impressive range of tones and gain. Wampler's take on the legendary Plexi tone packed in a versatile platform. RAT2 is another classic stompbox that brings impressive performance and abundant flexibility. Very light distortion that caters to Rock, but brings high quality tone. Quintessential distortion pedal used both by legendary guitar players and the masses. Handmade design that brings one of the most refined distortions available today. One of the best and only Klon Centaur clones on the market. More refined affordable dist box that brings great performance and limited versatility. Affordable fuzzy distortion that brings quality you rarely find in this price-range. When it comes to distortions and overdrives in general, there were certain pedals which had a massive impact on the industry. 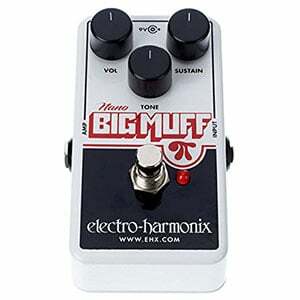 One of the is definitely the Big Muff Pi from Electro-Harmonix. It was that good that a lot of modern stompboxes are based on its legendary circuitry. Yet, the original is still holding up. Nano Big Muff is a compact version of the original design, but it’s every bit as potent and capable. The pedal features three controls, a very sleek looking enclosure, and brings a thunderstorm. If you are looking for large amounts of gain, this bad boy delivers that in abundance. With that said, the gain is not raw and chaotic. On the contrary, it is very controllable and easy to work with. The pedal offers a lot of range, which is something you have to appreciate. Once you plug it into your signal chain, you can go anywhere from a very saturated dirty distortion to a more contained one with a turn of a knob. MXR’s ability to produce refined pedals didn’t end even when they were acquired by Dunlop. M75 Super Badass is a great example of this policy. The name is appropriate, to say the least. To put it in simple terms, you get a very hot distortion pedal that can deliver vast amounts of gain on demand, but there’s one important feature. This thing comes with a three-band EQ. That maybe doesn’t sound all that important, but once you start tweaking the tone, you realize just how much it means to have this feature. Speaking of tone, Super Badass is all over the place. You can dial in a great rock tone full of slight overdrive goodness, or you can go all out and saturate that signal with a very crisp distortion. The choice is yours. One great thing about this pedal is the fact that you’ll never feel like your tone is shallow or too muddy. All it takes is a tweak of the EQ to get any imperfection sorted out. 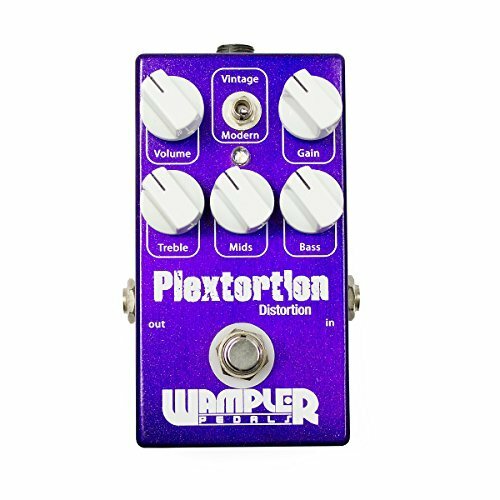 Wampler’s Plextortion is a unique piece of work, as always manufactured with care and style, meant to cater to distortion lovers as well as those of you who prefer the famously classic “plexi” sound – which was heavily popularized in the 80’s. This pedal features TrueBypass, capacitors/resistors offering immaculate responsiveness, in a simple to use interface that won’t cause troubles for anyone; it shows how the manufacturers think everything through before releasing it upon us. The controls on this pedal offer Treble, Mids, Bass, Volume and Gain knobs. Vintage and Modern types switching are also featured on this overdrive pedal, offering Lighter/Darker tuning, which can also be witnessed on the Dual Fusion Overdrive. This masterpiece is reminiscent of the Pinnacle, aiding in sound reproduction equal to the likes of Guns’N’Roses, AC/DC and much more. The controls by themselves provide extremely varying refinement choices, which guarantee remarkable end results and a continuously overwhelming feeling. Today’s distortion effect market is full of great modern designs, but some vintage ones as well. One of the latter which really withstood the test of time is the Pro Co RAT2. This thing is old school in every way imaginable. The enclosure it comes in is reminiscent of the time when effects pedals were just becoming a thing, and the tone it offers is simply on a level of its own. For these reasons, RAT2 has found its way onto many popular musician’s pedalboards. One glance at the control panel tells you its a very simple pedal to use. Back when it was designed, simplicity was the name of the game. Even though it gives an impression of a somewhat limited stompbox, RAT2 packs a lot of range in terms of distortion. You can adapt it to a gentle rock sound, or a more sinister metal tone with ease. On top of all that, Pro Co RAT2 is one of the most affordable iconic distortion boxes available today. MXR M104 Distortion+ is a very strange beast. The pedal offers one of the most authentic distorted tones you can get, and it has been doing so for numerous decades. What makes it strange is the fact that it’s a germanium based distortion. Use of germanium is a tell-tale mark of an old school fuzz box, but M104 isn’t really a fuzz pedal. This odd combination results in a very interesting tone which offers a lot of range. In a sense, you can go from a heavier overdrive all the way to a fuzzy distortion tone. If it didn’t have the sustain it has, this stompbox would probably fall within the fuzz category. In simple terms, it’s not your regular dist box and that makes it pretty interesting. The design is as simple as it can be – with two knobs and a footswitch available to shape the tone. 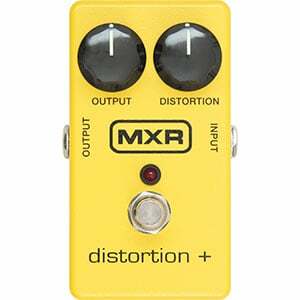 If you are looking for a more vintage sounding distortion, this MXR is definitely one of the better choices available. DS-1 is both one of the most popular distortion pedals ever created, and one of the most misunderstood ones. A lot of people expect to just plug it into their signal chain and get that thick distortion. That is not how DS-1 works. Instead of overwhelming your tone with chaotic distortion, like most modern designs do, Boss DS-1 is designed to spice up your clean signal, but also clean up the signal which is already passing through a more aggressive distortion pedal. Learning how to use the DS-1 is a bit tricky, which is exactly why so many new users get disappointed by it. However, once you figure out all of its intricacies, it will become your favorite thing. DS-1 is the type of pedal which you keep turned on all the time. Bottom line, it’s a very unique pedal that can be found on pedalboards belonging to legends such as Joe Satriani and similar. 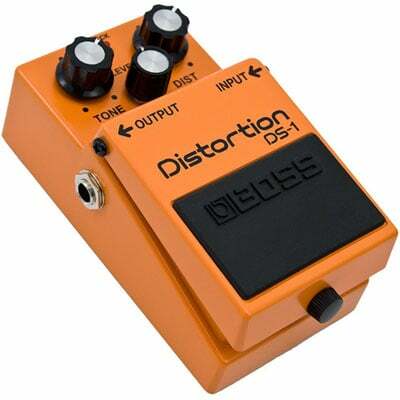 It is also one of the most affordable distortion pedals you can grab at the moment. Hoof is another legendary design which has been around for a while in one form or another. This particular model is perfect for those who are looking to get a bit more than just your standard distortion. What makes Hoof so special is the fact that it can act as a fuzz box as well as a distortion and everything in between. That sounds good on paper, but wait until you plug it in and taste the spectrum of tones you get to dial in. The enclosure is pretty simple and features four knobs for easy tone shaping. In terms of reliability, you definitely don’t have to take it easy on EarthQuaker Devices Hoof. It can take whatever you’re capable of dishing out. Overall, this is a great dist box that packs a hot, agile tone which will satisfy a wide variety of tastes. On top of all that, it is priced very reasonably when you take into account the performance it offers. It’s no secret that Electro-Harmonix offers a wide range of distortion pedals, each with its own benefits. However, one of their more interesting models is the Soulfood. What makes it so interesting is the fact that it was based on the legendary Klon Centaur dist box, which was known as one of the most refined yet aggressive distortion pedals of its time. Klon Centaur is no longer available, which is why a lot of guitar players were excited about the Soulfood. In terms of appearances, Soulfood comes in a very sturdy, simple enclosure which was designed to withstand the unforgiving conditions associated with serious stage use. 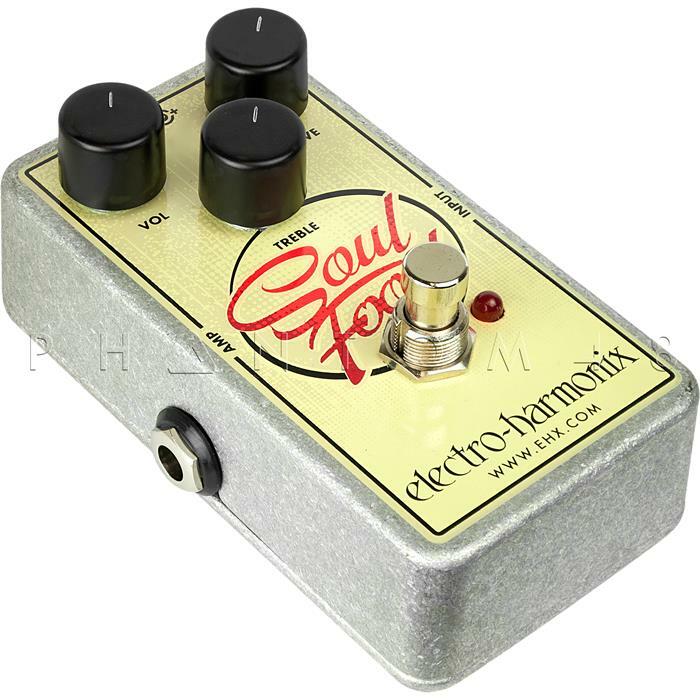 The tone you get from Soulfood is very much similar to the Klon Centaur, but a bit more refined. There is a lot of range in this thing, meaning that you can use it as a booster pedal, as a dirty distortion and anything in between. Electro-Harmonix priced this model in a way that makes it attractive no matter what your budget is like. Next in our selection with a simpler, yet very effective choice, the SL Drive – falling under the famous Xotic Effects pedal product line, as one of their most affordable pieces. This intuitive work of art shouldn’t fool you, it offers high-end Distortion effects and quality in reproduction, it has helped the likes of Jimmy Page in crafting the feel of their sound. The pedal offers True Bypass and four switches allowing you to go through and select some sounds mimicking vintage releases dating back in the 60’s – The Super Lead and The Super Bass. The control settings on the front side are pretty standard and offer tuning of Tone, Drive, and Volume. The range of the controls varies in interference with your original sound, ranging from smoother to grainier all the way up to endless aggression, refine it to whatever suits your style of play regardless of genre. A top pick, if you’re starting out, as it provides impressive sound quality at an extremely affordable price tag. Lastly, we have one of Behringer’s affordable wonders. Super Fuzz SF300 is an extremely versatile cheap solution for anyone looking to get some dirt on their signal on a budget. This pedal comes with three distortion settings, including straight up fuzz, which gives you great tone shaping options. This is especially true considering the price range we are talking about. Even though it’s primarily a fuzz pedal, Super Fuzz SF300 works great as a distortion pedal. Sure, the distortion setting does lean towards fuzz in a number of ways, but it still has the trademark features of a true dist box. In all honesty, if you are on a tight budget and you need some variety in your tone, Behringer Super Fuzz SF300 is one of the cheapest and most versatile ways to get that. A lot of guitar players tend to stay away from ‘jack of all trades’ pedals, however in certain cases, these are the best viable solution. This would be one of those rare cases. When it comes to adding some girth to your guitar tone, you have two options. You either go with an overdrive or a distortion pedal. There’s also a fuzz option in between, but those are not as popular as the two pedals we’ve mentioned. If we were to say that overdrives are powerful but tame devices, then distortions are pure savages. The whole idea of such a pedal is to push out as much gain as possible. This is done by using transistors and clipping diodes. Circuitry of an average distortion pedal takes the input signal, mangles it and spits it out. As crude as this descriptions is, that’s more or less what happens inside a dist box. With that said, there are different levels of distortion out there. Not every pedal is the same and you will find that various models are streamlined for specific purposes. What Makes A Good Distortion Stombox? Here’s where things get interesting. One of the most important aspects is naturally the gain. After all, this is what makes distortion so brutal and one of the best effects pedals in use today. However, there are other aspects to it as well. Different stompboxes allow you to manage different parts of the tone. Some are pretty straight forward while others area leaning more to the aggressive side of things. Generally speaking, you want a pedal that has plenty of range and a somewhat decent tone. The latter really comes down to hearing it. Since the clipping and hence distortion is completely artificial, different brands tend to have different flavors. You just have to find one that suits your needs and personal preferences. Now that we have covered all the basics, lets touch upon how a dist works in relation to other gear. By that, we mostly mean your guitar. Those who are starting out need to understand that their choice of guitar has a lot of impact on what kind of tone profile they will end up having. For example, we have the matter of single coils and humbuckers. Single coils are great for many things but distortion isn’t necessarily its forte. Sure, there are bands out there like Iron Maiden, who have forged their fame over the sound of single coils. However, Iron Maiden are more of a fluke. If you want to extract the most out of your pedal, you will need a set of decent humbuckers. To go a bit deeper into this subject, the type of humbuckers matters as well. Here’s where we need to drop a small disclaimer. Any humbucker is better than single coils. We are talking both passive and active ones. With that said, there is a difference. Active humbuckers are better at channeling high gain signal, which makes them great for heaviest genres. The point we are trying to make is that you will have to figure out what kind music you want to play and acquire gear according to that. It will make your life much easier in the long run. Since we have already mentioned various distortion types, it is only logical to address each in particular. The simplest way to do this is to take Boss as the example. They have three models that really define these categories well. The most tamed one is definitely the DS1. DS1 is the all time classic. It has been around for decades and has found itself on pedalboard of some of the best guitar players in the world. For the most part, it packs just enough gain to give you some range over a standard overdrive, but nowhere near enough to drown your signal with it. Additionally, something like a DS1 plays very well with tube amps. If we had to choose, we’d say that DS1 and similar models are well suited for classic rock to classic metal. It’s the type of dist box you would pair with a good delay and just have a good time. Now we transition to more modern solutions. This the territory where DS2 resides. Compared to DS1 it has a bit more gain but an amount we can still consider to be civilized. DS2 also allows you to be more aggressive and explore outer limits of its capabilities without putting too much at risk. For all intents and purposes, it is an awesome general option. Metal distortion pedals deserve a segment of their own, and for a good reason. Models such as MT-2 Metal Zone really take things to the extreme. We are talking mad amounts of gain but also plenty of features to control said gain. In all honesty, these aren’t the optimal choice if you need a general purpose stomp box. As long as you try to extract a real heavy dist tone, you won’t have an issue. However, when you try to tone it down, you will find that it very easily thins out. Should You Go For A Proper Tube Amp Instead? At the end of the day, the guitar effects are means to an end. Especially if you are looking to get that heavy, sledgehammer type tone. Most pros generally don’t use stompboxes but rather turn to beastly tube amps. Think something like Peavey 6505, MESA/Boogie Dual Rectifier or similar. Those amps push out organic, high gain distortion without breaking a sweat. With that said, those amps also cost a pretty penny. That leads us to our next point. Distortion pedals are a substitute, an affordable one at that, which allows you to get the tone you want without spending thousands of dollars. Does that mean that you getting a sub par tone? Definitely not, but it’s worth understanding that every tool is designed to accomplish a specific purpose. In that sense, distortion pedals have their own purpose to fulfill. That’s what it’s in store so far when it comes to your distortion needs. Check out the full reviews at your convenience if you feel like you need to know more about what these models offer, one thing’s for sure, though, you can’t go wrong here with whatever your choice ends up being. If you’re left wanting for more, check back again as we’ll update this list continuously over time.